In 1951 Janet Collins became the first black prima ballerina to perform with the Metropolitan Opera Ballet in New York City, New York. As such she broke one of the last major color barriers in classical ballet. Janet Collins was born on March 2, 1917 in New Orleans, Louisiana. Her mother was a seamstress and her father was a tailor. In 1921 when she was four Janet moved with her parents to Los Angeles, California. At the age of ten, Collins began to study dance. Her first dance training was at the Los Angeles Catholic Community Center. Ironically, Collin’s parents urged her to study painting rather than dance because at the time, art seemed to offer more opportunities to gifted African Americans than classical dance. Collins studied art on a scholarship at Los Angeles City College and later at the Los Angeles Art Center School. 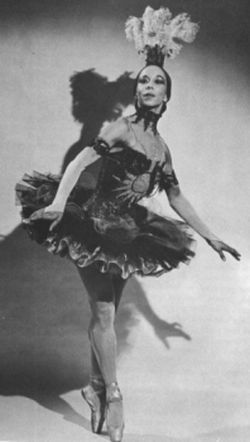 Collins gave her first prima ballerina performance on November 3, 1948 at the Las Palmas Theater in Los Angeles, which left critics hailing her as a unique performer. Three years later in 1951 Collins was hired by the Metropolitan Opera as its prima ballerina. At the time she was 34. Collins remained at the Met until 1954. She then began teaching ballet which included using dance in the rehabilitation of the handicapped. In 1974 she retired from performing and teaching. The last years of her life were spent painting religious subjects in her studio in Seattle. Janet Collins died on May 28, 2003 in Fort Worth, Texas. She was 86. Janet Collins and Yael Tamar Lewin, Night's Dancer, The Life of Janet Collins (New Haven, Connecticut: Wesleyan University Press, 2011); Brian Lanker, I Dream A World (New York: Stewart, Tabori & Chang, 1989); Yael Tamar Lewin, “Janet Collins: A Spirit That Knows No Bounds” Dance Magazine, 71:2 (February 1997); Brenna Sanchez, “Janet Collins,” Gale Contemporary Black Biography , www.brennasanchez.blogspot.com/janet-collins.